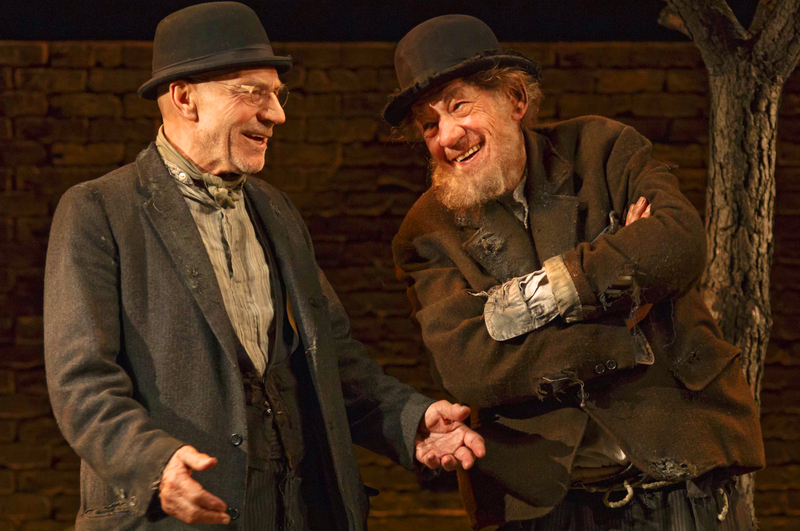 This surprisingly sentimental Godot owes its uniqueness to the decades-long friendship of Ian McKellen and Patrick Stewart (which dates back to the 1970s). For the first time I believe that Estragon/Gogo (McKellen) and Vladimir/Didi (Stewart) truly have known each other for the endless lengths of time that playwright Samuel Beckett suggests. Waiting for Godot revolves around two tramps (Gogo and Didi) waiting on a desolate rural road for someone named Godot who may in some way “save” them. Almost nothing happens while they wait, so they pass the time with wordplay, poetry, slapstick — except when landlord Pozzo (Shuler Hensley) and his slave Lucky (Billy Crudup) turn up, spouting their own slightly different sort of nonsense. Director Sean Mathias seems more focused on the comic and coolly intellectual sides than many interpreters, to very good effect. And he has his stars’ incredibly easy chemistry to work with, which gives the evening a playful suppleness that leavens play’s air of dark, existentialist despair. Their affection for each other is incredibly palpable – this is the first time I’ve seen an audience respond with a heartfelt “Aww” when Didi and Gogo are kind to each other. McKellen’s humor tends toward the physical and poignant – his Gogo has already put himself past all hope as a way of coping, and does not hesitate to give into animal impulses. Stewart’s approach to Didi is a more verbal and cerebral one: this Vladimir is a deeply disillusioned humanist and moralist, providing a brilliantly austere contrast to McKellen’s feral clowning. Hensely’s and Crudup’s part are smaller and more one-dimensional, but they execute them with great élan. Godot is a dangerous play: it can be deadly boring if played too reverently. Mathias and this Sir-lead cast have steered clear of this danger, giving us a Godot that is as full as it should be of humor, intelligence and dread – as well as an unexpected amount of warmth. Nice review! Dovetails to my feelings exactly, unlike the NY Times. So many I’ve spoken to very much like this Godot, can’t understand the Times hostility.